Take Exit 3. Walk towards Almond/Roopongi crossing. Take a right at Almond, walk down the hill (Imoaraizaka) and pass Bacs Cafe. Take a left at the first corner (There's a flower shop at the corner), cross the street to the right and walk into the street at a Izakaya bar with a big red sign. (Please do not take a left to get out into a big road called "Gaien-Higashimae dori") You will see No.2 Rene Building on your right. 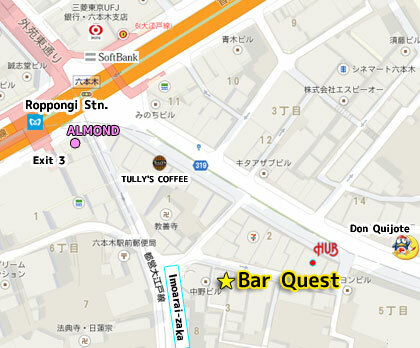 The party venue called "Bar Quest" is on the 3rd floor of the bldg. It takes a few minutes to walk from Roppongi station. Copyright (C) 2015 Tokyo International Party All Rights Reserved.